The ELCA describes it more than defines it as “communities of Jesus…” (not just congregations, but also social service organizations, campus ministries, etc.) 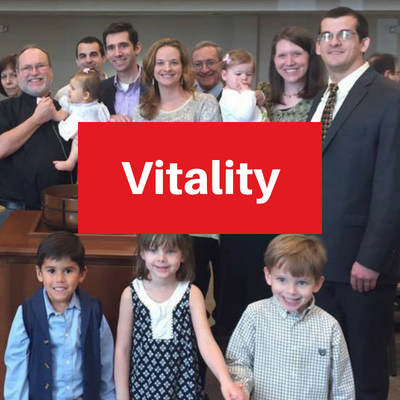 “…that nurture life-changing relationships with God, one another, and the world.” What’s different in having vitality as our top focus? It replaces the old model of sustainability and viability as our chief institutional goal and natural tendency. Though important, none of us individually nor institutionally is ultimately “sustainable.” Our job is to live fully while we can. If Jesus sees himself as the fulfillment of such prophetic witness and we see ourselves as followers of Jesus, then prophetic voice is an essential part of our discipleship, focusing on news that is truly good to the poor, to prisoners, to the blind, and to the oppressed. We should not be surprised when such a priority unsettles the status quo of other priorities that seek fulfillment in consumerism, personal and institutional gain, and the sinful self. Nearly two years ago my father was diagnosed with inoperable and therefore terminal liver cancer. This was devastating news for him and our family, but as a family of faith we all decided, whether we verbalized it or not, that Dad’s job was not to die. Dying, in its time, takes care of itself. Of course, he did some procedures that prolonged his life, eased his pain, and put off the dying for a time. His baptismal calling wasn’t to die, though. It was to live in this life as faithfully and fully as possible and to focus on abundant living as long as he could and the promise of abundant life fully with Jesus even when death in this world seemed to have had the final word. He died to this life about 13 months ago. We grieved then and still grieve today, but we are grateful for the faith that my dad paid forward to us and which, through us, continues beyond the grave to pay faith forward through his children and grandchildren. Some, if not many, of our NC Synod congregations, might be diagnosed as terminally ill by the old measures of sustainability and viability, but all of them, in some degree, are and can be vital, even if they are far along in the inevitable process of dying. Their calling, like my Dad’s, isn’t to die. That will come in its time as it will for me, for you, and for every congregation and every institution and every nation under the sun. The question we want to help our congregations focus on is, “How might we be as vital as possible?” whether we have 5 or 500 years of institutional vitality. And when we die, we hope and trust that we have paid the Gospel forward over our years of ministry and continue to pay it forward in releasing our stored servanthood (people, money, property) in new communities of Jesus. It’s the way of the world, the circle of life, and the calling and the promise of the Gospel. Your congregation can be vital but not sustainable. It can also be quite sustainable but not vital. The new measuring stick is whether we’re developing and nurturing life-giving relationships with God, with each other, and with the community, whether there are 1200 in worship or 12. We believe all of our congregations can be vital and that this realization and lens in itself is life-giving. Jesus, in John 10:10, said he came “…that we might have life, and have it abundantly.” Circling the wagons and turning in on ourselves as we become aware of decline or challenges—or when we’ve been “successful” by worldly standards and discern that we’d better preserve all this—is the worst thing we could do. Jesus has this church. Jesus has us. Jesus will reconcile all creation at the end of all earthly things. In the meantime, risk. Love. Live!